3 bedroom holiday apartment for short lets in Mellieha with access to a rooftop swimming pool. One bedroom with a double bed, and the other two with two single beds. Close to all ameneties and northern beaches. A two bedroom apartment to rent for holidays in Mellieha, Malta with a high standard of modern furnishing. Fantastic views from the terrace. Located within a few minutes drive to all the northern beaches of the Island. Apartment for rent in Mellieha. Accommodation offered in the form of 2 bedrooms with two double beds. 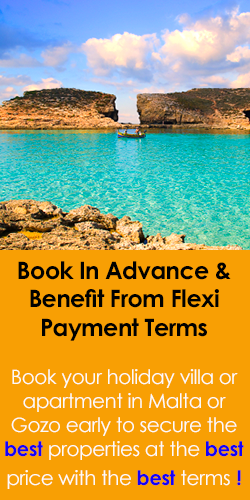 Ideally located closest to one of Malta's largest sandy beaches. Two bedroom Sea Front apartment rental located in the centre of St Julians with amazing views of the St Julians bay seaside promenade which is just opposite the apartment block. Excellent location. Two bedroom holiday apartment with a typical Maltese balcony enjoying direct open sea views. Sleeps up to 5 persons, available for short lets, equipped kicthen, dining area. Wifi internet available and fully airconditioned. One bedroom holiday flats in Mellieha enjoying a double bedroom and a combined kitchen/living area with use of a roof top pool. Enjoys sea views from terraces. Good location, close to all ameneties and beaches. Two bedroom Malta holiday apartment for rent in Mellieha with shared pool use and sea views. Accommodation for up to 6 guests. Highly recommended. Exceptional 3 bedroom apartment for short lets in Mellieha forming part of a private villa with swimming pool enjoying direct sea views from the pool the deck. Modern furnishing throughout. Wifi, BBQ , dine by the pool. One bedroom holiday apartment rental in St Julians Malta. 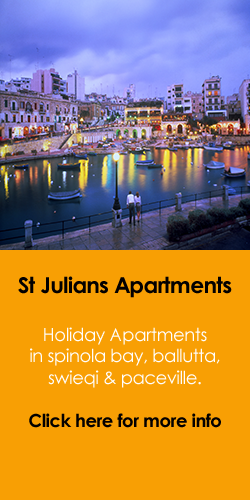 Five minutes away from the sandy beach of St Georges bay and no more than ten minutes on foot from St Julians centre. Excellent location. A central property available for short lets situated in a new block in a prime location of Sliema. Five minutes walk from the saefront promenade, shops and restaurants. Three bedroom apartment in Sliema/Gzira to let in an excellent area just of the Strand with numerous shops, restaurants, cafes, seaside promenade, boat trips within walking distance. Highly recommended for location. A 3 bedroom holiday rental apartment in Malta located in a exceptionally quiet & rural area, set in the countryside in the limits of St Paul's bay yet a short drive away from the seaside towns of Bugibba, Qawra & Ghajn Tuffieha. 4 bedroom apartments for short lets in Malta, situated on high grounds equipped with a kitchen, living room, dining area, 2 bathrooms and enjoying the use of a lovely swimming pool and large pool deck. Mellieha, Malta Property Rentals. Apartment with fantastic infinity swimming pool, with views towards the beach of Mellieha Bay (Ghadira). Forming part of a villa property, One bedroom providing accommodation for 2 adults plus 1 child. Santa Maria Estate in Mellieha. Self catering holiday apartment with swimming pool offering accommodation for up to five guests in two fully furnished ground floor (lower villa) apartments. WIFI available. One bedroom apartment rental in St Maria Estate, Mellieha that accommodates up to 3 persons & has use of a large swimming pool that forms part of a private villa sharing with 2 other apartments. Fantastic location, beaches nearby. 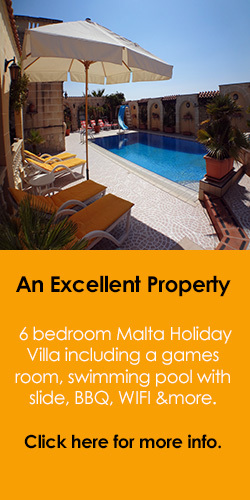 Rent one of two holiday apartments in Malta sharing a fantastic swimming pool enjoying fantastic sea views in Mellieha. Excellent property throughout and Highly Recommended for Short Lets. located in St Maria Estate. This lovely holiday apartment in St Maria Estate, Mellieha, Malta which forms part of a private owners villa which rents two apartment units that may be rented together or separately subject to availability. Excellent property. A lovely 2 bedroom Mellieha holiday apartment for rent forming part of a large private villa property. Fantastic swimming pool area shared between 2 other apartment units if occupied. Sea views, garden, WIFI. Highly recommended. One bedroom holiday apartment to rent in Malta with exceptional sea views from terrace/balcony facing Valletta across the bay. Sea side promenade just across the road. Limited availability...fantastic location. Modern two bedroom fully equipped penthouse/apartment in Zurrieq offering weekly rental accommodation for up to three persons. Two terraces, lovely distant sea and country views. Accommodation in Malta in this fabulous apartment forming part of a private owned villa property. 3 bedrooms accommodating up to 8 guests, shared pool, WIFI enabled. Attractions and all ameneties nearby. Quiet residential area. 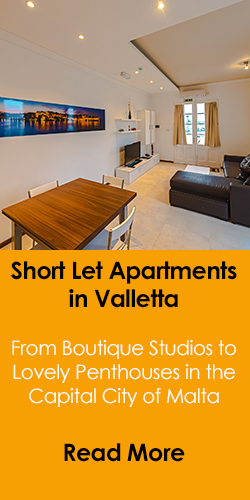 Valletta apartment for rent in Malta, available for short lets. Charming British-owned spacious self-catering holiday apartment in the heart of the capital city, with views over the grand harbour and the three cities. Malta sea front apartments for short lets. Lovely two bedroom apartments enjoying direct sea views and close to numerous restaurants, bust stops, shops, seaside promenade and other amenities. Apartments enjoy a balcony or terrace. Lovely two bedroom apartment in Sliema Malta to let for short stays enjoying a terrace/balcony with lovely sea views and Valletta bastions. The apartment block is in a perfect location directly facing the seafront. Sliema Direct Sea View 2 bedroom apartments for rent with a balcony or terrace for leisure or business trips. Bus stop nearby, shops, restaurants, all amenities. Just opposite the promenade. Highly recommended. Three bedroom Sliema apartment for rent. 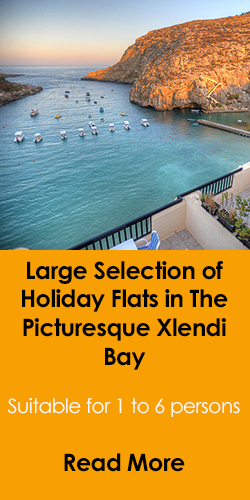 Ideally located just of the Strand and the promenade offering holiday accommodation for up to seven persons. Also enjoys a terrace with inland/street views. Duplex penthouse apartment rental for holidays in Malta, in the seaside village of St Pauls Bay. Enjoying sea views form the terrace. Highly recommended. Luxury holiday accommodation available in a 3 bedroom villa apartment with Pool and Heated Indoor Pool located in the highly sought after and exclusive St Maria Estate. Use of shared swimming pool. Free WIFI available. Beach 5 mins away. SPECIAL DEAL AVAILABLE. Two bedroom apartment offering holiday accommodation in Mellieha, Santa Maria Estate, for up to 4 persons in a smart recently built block of apartments available for short lets. Rooftop pool with excellent views. One bedroom short let Sliema apartments with a balcony with inland views. Well apportioned includes telephone, TV with satellite channels. Within walking distance to the promenade, restaurants, a yacht marina and all ameneties. Two bedroom apartment just around the corner from the center of Sliema, the Strand & the Tigne shopping district facing Valletta. Attractions nearby including cafes, restaurants, island cruises. Easy bus links. Very modern apartment located metres away from the Sliema promenade and 1 min walk to the Sandy beach of Balluta bay. Bus stops are only a minute walk from apartment with coffee shops, pizzeria and restaurants all nearby. Excellent Property. Tastefully restored townhouse, situated in an excellent area just two minutes off Balluta square, with all the best restaurants and the seafront promenade of Sliema and St Julians within walking distance. Excellent location & spacious one bedroom apartment fully equipped with kitchen, bathroom, air/conditioning located in the best part of Sliema, just off Balluta bay promenade. may accommodate up to 4 persons. Close to restaurants, coffee shops, bus stop etc. Modern spacious 1 bedroom apartment fully equipped with kitchen, bathroom, air/conditioning located in the best part of Sliema, only one min walk from Balluta bay promenade. Close to restaurants, coffee shops, bus stops and sandy beach close by. Highly Recommended. Modernly furnished St Julians two bedroom compact penthouse situated a few minutes away from Balluta bay, consisting of 2 double bedrooms, shower room, kitchen/living and large terrace with valley and sea views. Fully equipped including TV, WIFI, BBQ and A/C. One bedroom sea view family suite apartments for short lets on the Sliema Strand, Malta. Just opposite the promenade which extends itself towards the Tower Road promenade and onwards to St Julians. Excellent location. Modern apartment situated in a quite residential street in the heart of Mellieha. All amenities including restaurants, bus stops, grocery and Malta's favorite beach (ghadira bay) are all within easy reach. An excellent property throughout. A lovely holiday apartment rental with direct sea views in Qawra, St Pauls bay with sun terrace/balcony enjoying fantastic views. Located in a tranquil area just 2 to 3 minutes walk to swimming pool lidos, shops and restaurants. Accommodates 1-4 persons. 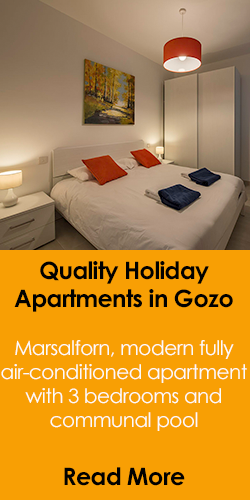 A fully air conditioned holiday apartment in Manikata, located a few minutes away from Golden Sands beach. Enjoying a modern finish with approximately 170sqm living space and a large terrace with sea and country views. A HIGHLY RECOMMENDED St Julians apartment with swimming pool, views of the sea overlooking the area of St Julians & Portomaso Malta. Fantastic location, walking distance to local shops, restaurants, bus stop and the beach. Free WiFi. Holiday accommodation offered in two bedroom apartments in Sliema, Malta. Balcony (inland view), seafront nearby, television with satellite channels, safe deposit box, harbour boat trips all walking distance. 3 bedroom sea view holiday rental apartment in Sliema, with terrace, TV, WiFi, Air-conditioning. The apartment enjoys direct views towards the capital city of Valletta across the bay. A bus stop, shops, cafes and restaurants are within a few minutes walk.